The Ingress Protection (IP) rating system is an internationally recognized scale that relates to proven protection against environmental factors such as liquids and solids. The scope of protection (degree of protection) of the enclosure housing is demonstrated using standardized test methods. In the following, the scope of protection is referred to as the degree of protection of the housing. A designation system is used to classify different types of housing according to their degree of protection. The designation system consists of the code letters IP followed by two characteristic numerals. These characteristic numerals are determined using tables. housing protects equipment by preventing the penetration of solid foreign bodies. The second characteristic numeral indicates the degree of protection of the enclosure housing in terms of potential damage to the equipment caused by the penetration of water into the housing. A housing type should only be given the first characteristic numeral (protection against penetration) for a specific degree of protection if it also meets the requirements of all lower degrees of protection. This condition also applies to the second characteristic numeral (protection against water) up to degree of protection 6K. However, a housing type given the second characteristic numeral 7, 8 or 9K (protection against steam cleaning) is not viewed as protected against jet-water (characteristic numeral 5 or 6). This means that the housing does not have to meet the conditions of characteristic numerals 5 or 6. Only a housing type with a double designation meets the conditions for protection against both jet-water and submersion. damage if the housing is bent at an angle of 15° either side of the vertical. Protected against spray-water Water that is sprayed at an angle of up to 60° either side of the vertical must not cause damage. Protected against splash-water at increased pressure Water that is splashed against the housing from every direction at increased pressure must not cause damage (only applies to DIN 40050 Part 9 testing). Protected against jet-water Water that is sprayed against the housing as a jet from every direction must not cause damage. temporary submersion in water Water must not penetrate in a quantity, which causes damage if the housing is temporarily submerged in water under standard pressure and time conditions. permanent submersion in water Water must not penetrate in a quantity, which causes damage if the housing is submerged under water continuously under conditions to be agreed between the manufacturer and user. However, the conditions must be more stringent that those of characteristic numeral 7. Protected against water during high pressure/ steam cleaning Water that is sprayed against the housing from every direction at very high pressure must not cause damage (only applies to DIN 40050 Part 9 testing). The IP69K rating is currently the highest protection available. The IP69K rating provides protection against ingress of dust and high temperature, high pressure water. This makes products with this certification ideal for use in conditions where equipment must be carefully sanitized. In industries such as food processing, where hygiene and cleanliness is paramount, equipment must be able to withstand rigorous high pressure, high temperature wash-down procedures. In many industries, where dust and dirt can be an issue, it is important to ensure that dust cannot penetrate the casing of a product and cause it to fail. 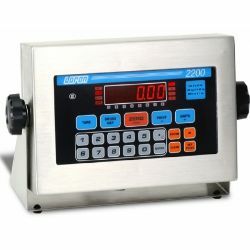 We currently have Avery Weigh-Tronix, Cardinal, Doran and Rice Lake products that meet this standard. In locations that demand heavy wash down, such as food processing, the high pressure water, chemicals and high temperature can destroy electronic circuits and instrumentation. The IP69K enclosure rating offers assurance that the scale indicator has passed tests and is durable & resistant to harsh environments. Watertight and Dusttight-Indoor and Outdoor - Type 4 enclosures are intended for use indoors or outdoors to protect the enclosed equipment against splashing water, seepage of water, failing or hose directed water, and severe external condensation. They are sleet-resistant but not sleet- (ice-) proof. They shall have conduit hubs or equivalent provision for watertight connection at the conduit entrance and mounting means external to the equipment cavity. Watertight, Dusttight and Corrosion-Resistant - In door and Outdoor - Type 4X enclosures have the same provisions as Type 4 enclosures and, in addition, are corrosion-resistant.